A four-bedroom unit at the exclusive freehold condominium Boulevard Vue is up for sale. The 4,391 sq ft unit on the fourth floor is being sold for $13.3 million ($3,029 psf). The owner is an Indonesian who bought the unit in 2010 for $12.61 million ($2,871 psf) and has decided to unlock the value of the property, says Eileen Koh, senior marketing director at ERA Realty, who is marketing the property. The unit has been leased to a French family for $19,500 a month since the condo was completed in 2013, she adds. This translates into an annual rental yield of about 2%. The lease will end in April 2019. Boulevard Vue is a 33-storey luxury condo developed by Far East Organization that sits on a 45,731 sq ft site and comprises 28 units. The condo is located along Angullia Park, off prime Orchard Boulevard. The property is within walking distance of Wheelock Place and ION Orchard as well as the Orchard MRT station. There are two executive penthouses that take up the top two floors and the roof terrace. An 8,051 sq ft penthouse was sold in 2009 for $33.41 million ($4,150 psf), according to caveats lodged. The remaining 26 units are four-bedders that each take up one floor. The latest transaction at Boulevard Vue was for the unit on the 13th floor that fetched $14.93 million ($3,333 psf) when it was sold in December. 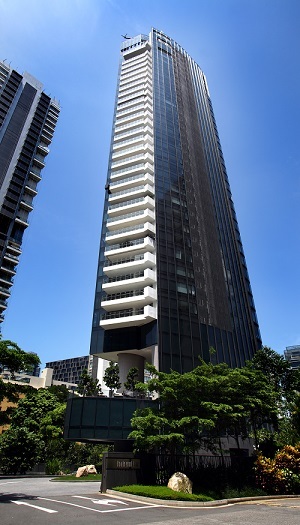 The most expensive four-bedroom unit sold, in terms of absolute value, was the unit on the 28th floor. The 4,456 sq ft unit was bought from the developer in 2010 for $21.39 million ($4,800 psf).